In the distant land of search engine results, there are two paths one can take to boost one’s website traffic. Here, nothing is certain. It’s a never-ending conflict between two artistries. It’s a continuous PPC vs SEO battle. What does it mean to become a PPC warrior? The path of the PPC warrior means becoming quick, flexible, and very effective. The downside is this quickness costs lots of money. What does the SEO warrior path lead to? The path of the SEO warrior means spending vast amounts of time learning, adapting, and improving. But, this dedication always leads to becoming extremely effective. The downside is it takes time to master this craft. So, what happens when you pit two masters of these crafts against each other? The bigger question is: Can one master the two ways and rule the land of search engines forever? The PPC master is fast. Pay-per-click is a craft of instant results… If you have the money, that is. You see, PPC works in very simple ways. If you are willing to pay for traffic, PPC platforms like Google and Bing will lend you their networks to place your ads. These ads appear in the sponsored section of each of these platforms. But, your location in the search engine results land is based on many factors. Paying the highest is the most important one. The SEO master is wise. Because they have spent the time to learn the craft, the SEO master has learned that the more time you spend on something, the better it becomes. And, once you’ve started getting results from the art of SEO, they’ll be free. SEO isn’t simply one craft. It’s many, the best ones actually. All lead to one goal. The goal is higher position in the organic part of search results. Following these best practices will help you achieve this without having to pay a dime for it. 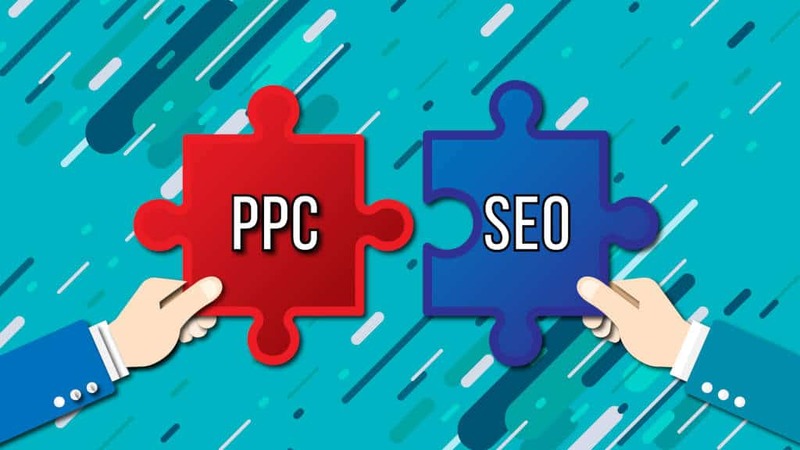 Which Path Is Better – PPC or SEO? The PPC and SEO paths are great. Everything depends on you – are you willing to spend your budget to get fast results? Or, you are willing to invest time and money so you can get organic ranks that cost nothing once you get them? Both ways have their pros and cons. And, both of them are viable ways to base a whole marketing strategy around them. Mastering organic search results isn’t something you can do in a day, a week or a month. It requires dedication, planning, perfect execution, and constant optimization. Clicks from SEO are free. Well, if you want to get technical they aren’t. You’ll spend time and money getting on the top of that first page of search results. But, once you get there, any traffic coming your way will be free. A high position for both branded and high intent niche terms will spread brand awareness. You’ll gain trust because only the best of the best are located on the top of organic search results. In fact, a lot of people actually skip the paid ad section from the search results. And, they go directly in the organic ranking section. The initial budget you’ll need to dedicate for SEO might seem scary. But, once you start getting results, the budget requirements will drop hard. SEO brings a bigger ROI than PPC in the long run. Getting at the top is hard. But that’s great. If you get to the top, your competition can’t just pay their way in. They need to work even more than you did to pass you in the search results. All you need to do is just optimize the pages from time to time and you’ll remain at the top. The biggest con of SEO is it takes much time to get results. But, that’s not all. If you don’t have an exceptional strategy, you could be trying to rank for keywords you can’t possibly rank for. You can’t beat giants who have held those terms for years and spent millions to keep them. Perhaps the biggest con of SEO is its high dependency on quality content. This means that you’ll need to develop exceptional content. And, do it better than everyone else that’s competing for the same terms. Link building is another con for SEO, as it’s a long and arduous process of rejection. But, please, for the love of god, never try to use link farms to build backlinks. You’ll regret it. Not a con per say, but still worth mentioning is the fact that SEO targets low intent terms. So, you’ll need to walk the extra mile and have a strategy prepared. These customers need extra work to convert into loyal customers. Before you start thinking SEO is the way to go, let’s talk about PPC. If lots of people ignore paid ads, what’s the point of using PPC? There’s a reason why it exists. It’s a quick and effective way to drive highly targeted traffic to your site. With SEO, you give everything to the search engine, like snippets, titles, meta descriptions. Then, you pray it selects everything you’ve provided. But, that’s rarely the case. Because you’re able to go into atomic detail with your PPC ads, you can do many A/B tests. The best part is you can get results in a few days. This will point out which part of which phrase works best for your conversion rates. To say PPC is fast is an understatement. You can literally create campaigns on a weekly basis. Then, spend two days to optimize them and the rest to reap the results. This is ideal for catching seasonal trends, like bank holidays. Unlike SEO, which hides a lot of information “in the name of privacy” (yeah, right), PPC has no such restrictions. Integrate the analytics tools with the PPC tool, and you’ll see all the details. Like which keyword converts highly and how much this costs you in real time, to name a few. Every once in a while search engines decide to update their algorithm. This spells a disaster for anyone doing SEO. With PPC, any change that might happen will never have a massive impact like this. If you play it right, the system will never play you. Don’t let naysayers fool you. PPC costs as much as the time you spend to optimize your campaigns. The more you fine-tune them, the less it will cost. It sure as hell costs less than paying ads in peak TV periods or buying ad space on billboards. As long as you keep on paying, you’ll be fine with PPC. But, the moment you stop, it’s over. Everything stops. This is always what marketers despised about PPC. No matter how much you spend on SEO, you’ll get to keep the results. PPC is not that kind. Also, it can become a massive budget drain. Especially if you plan to launch international campaigns instead of local ones. And, no matter how good of an ad copy you’ve made with extensive A/B testing, the one with the deepest pockets always wins. PPC allows shady practices. You can blatantly rip off your competitor’s ad texts. You can even use their branded terms as keywords to place ads. PPC requires a constant hands-on approach. Bids must be optimized, CTR rates need monitoring, quality scores need increasing. Who Wins, SEO or PPC? Can You Master Both PPC and SEO and Rule Search Results? If you want to master both, you need to ask yourself do you really need that? A local business can do with just basic SEO and still have results. But, if you are to compete with giants, SEO might not work. At least not quickly. At the end of the day, it all depends on your plans. If you want results ASAP, go for PPC. If you’re in it for the whole ten yards, go for SEO. If you want quick results, but you want to go for SEO, do that too. There isn’t a clear cut way. Sometimes, you’ll be competing for a very difficult organic keyword. Other times, you’ll be bidding for very expensive ones in PPC. Whatever you do, creating a strategy for both initial and over-time results is the best way to go. With it, you can realize what to do. A good marketing strategy will enable you to use both. Even with their pros and cons, they work best when complementing each other. By using both you can rule the land of search engine results. You can test data that you’ll later use for SEO in a PPC campaign. Whether it’s a description phrase, a title, or a call to action, PPC’s fast data return is golden. Having a result on the first page in both organic and paid search results will give you both inflows of traffic. You can remarket to your SEO audience through PPC. You can test keyword performance in PPC, and then start coming resources for SEO. SEO and PPC are both great. Each has its quirks, and they complement each other greatly. Although it might not be right for every business, trying to make both works in unison will make you the king of search results. The possibilities are endless really, it’s all about whether you want to commit or not. At the end of the day, digital marketing is all about using every possible marketing channel. You must use everything to reach your target audience and increase your profit.